Reading is one of the most important skills people learn and use throughout their entire life. Parents who read to their children experience a closer bonding time with their children, even when they start reading to their children before they are born or while they are very young. Even while in the womb, babies are aware of their parent’s voices and they will associate reading as being important when they are older. Babies love to hear the sound of their mother or father talking or reading to them. The fascination of voice changes and movement of the face gives the baby something to watch. Your child, particularly in infancy is bonding with you every moment. Reading, speaking, even when not reading is important to that process. It means that you’re close and they can hear and feel you, giving them a greater feeling of security. When the children are a bit older, they are able to follow a simple story with good illustrations and a few words. This is a good time to read books about common items in life, such as books with pictures of clothes, books, toys and so on. Look for books with easy to see pictures that are bright and colorful. Say the name of the picture slowly, small children are quick learners and will be able to point out the objects if you ask them to do so. This is a first step to learning to read. Take time to read for yourself because this shows your children that reading is important and they are much more likely to read if you are reading also. It is a good idea to make a point of using the reading time as a prelude to bed or naptime because it allows the child to relax and calm down before sleeping. This is a good habit to instill in your children because it gives them a nighttime routine that they can use as they get older. 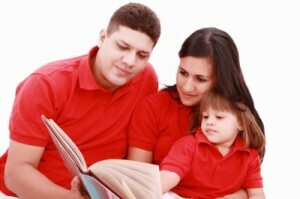 It is recommended that you read to your baby every day once they reach six months of age. Be aware of activities you do every day and talk to your child about them in simple terms. Hearing the words and seeing the pictures in books will help your child to learn quicker and have a better education when he or she enters preschool and elementary school. When children are reading or are read to before elementary school, they pick up the skill much more rapidly. It is also a good idea to limit television exposure to those programs which are not violent. There are good programs out there for young children to help them learn, but it is important that parents spend time with the children, in play and reading to them. The greater use of vocabulary a child has by the time he or she enters school, the better he or she will do. Joyce is a loving parent and writer for the My Baby Bedding Shop Blog. Take a look at her Baby Boy Bedding Sets. I like it very much this is the most valuable post, keep up the good work. ÃÂ›ÃÂ¸ÃÂ»Ã‘ÂÃÂ½ÃÂ°:ÃÂ¡ÃÂ²ÃÂ¾ÃÂ¹ Ã‘ÂÃÂ°ÃÂ¹Ã‘Â‚ -Ã‘ÂÃ‘Â‚ÃÂ¾ Ã‘Â‡Ã‘Â‚ÃÂ¾-Ã‘Â‚ÃÂ¾ ÃÂ½ÃÂ¾ÃÂ²ÃÂ¾ÃÂµ,ÃÂ¸ÃÂ½Ã‘Â‚ÃÂµÃ‘Â€ÃÂµÃ‘ÂÃÂ½ÃÂ¾ÃÂµ, Ã‘Â‚Ã‘Â€ÃÂµÃÂ±Ã‘ÂƒÃ‘ÂŽÃ‘Â‰ÃÂ¸ÃÂ¹ ÃÂ¸ ÃÂ²Ã‘Â€ÃÂµÃÂ¼ÃÂµÃÂ½ÃÂ¸ ÃÂ¸ Ã‘ÂƒÃÂ¿ÃÂ¾Ã‘Â€Ã‘ÂÃ‘Â‚ÃÂ²ÃÂ°.ÃÂ¡ÃÂ¿ÃÂ°Ã‘ÂÃÂ¸ÃÂ±ÃÂ¾ ÃÂ½ÃÂ°Ã‘ÂˆÃÂ¸ÃÂ¼ ÃÂ½ÃÂ°Ã‘ÂÃ‘Â‚ÃÂ°ÃÂ²ÃÂ½ÃÂ¸ÃÂºÃÂ°ÃÂ¼ ,ÃÂºÃÂ¾Ã‘Â‚ÃÂ¾Ã‘Â€Ã‘Â‹ÃÂµ ÃÂ´ÃÂµÃÂ¹Ã‘ÂÃ‘Â‚ÃÂ²ÃÂ¸Ã‘Â‚ÃÂµÃÂ»Ã‘ÂŒÃÂ½ÃÂ¾ Ã‘Â…ÃÂ¾Ã‘Â‚Ã‘ÂÃ‘Â‚,Ã‘Â‡Ã‘Â‚ÃÂ¾ÃÂ±Ã‘Â‹ Ã‘Âƒ ÃÂ½ÃÂ°Ã‘Â ÃÂ¿ÃÂ¾ÃÂ»Ã‘ÂƒÃ‘Â‡ÃÂ¸ÃÂ»ÃÂ¾Ã‘ÂÃ‘ÂŒ! LOL had to come here and get the context of your post (from email alert on comments) I thought you were talking about me, I was like HUH? lol Carry on…. The thing about his humility is true by the way. I’ve heard many stories. But there’s also a more personal one. My grandfather once ran into this guy at the Chola Sheraton (Chennai) in the very early 90s and this guy was apparently amazingly down to earth and chatted with him in a very self-deprecating way.